As you might expect, color swatches on home computer screens are subject to variation based on monitor color settings, so we are asking everyone to send for our Concealer Sample Box before ordering full-size compacts. 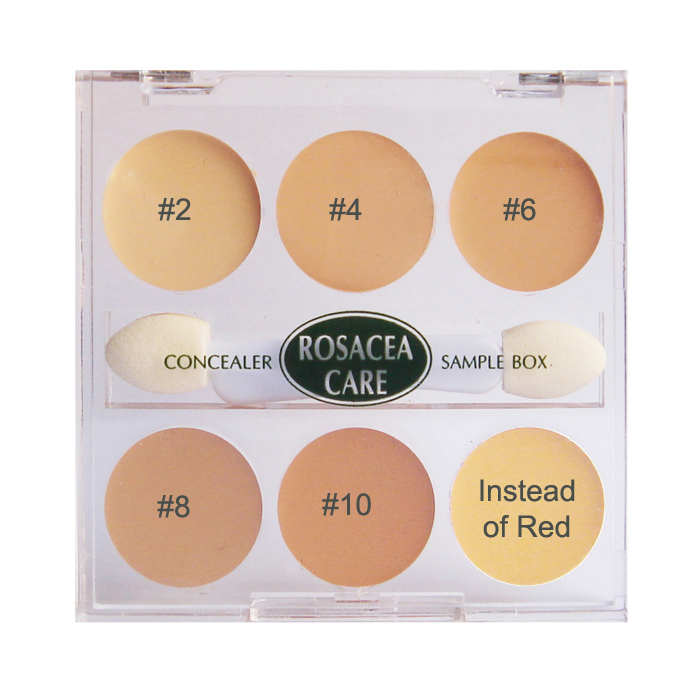 The Sample Box contains ample amounts of each of the six colors plus applicators, and it gives an excellent opportunity to find which color is the perfect match for your skin. To determine the right color, begin with a touch of #6 or #8 on your cheek. It will then be easy to see whether to go lighter or darker. The Instead of Red shade can be used to conceal redness and can be applied as a primer under your favorite mineral foundation. Note: After choosing the ideal match for your skin color, try a lighter shade around the eyes to conceal circles. The darker shades can serve as a bronzer. To determine the right color, begin with a touch of #6 or #8 on your cheek. It will then be easy to see whether to go lighter or darker.